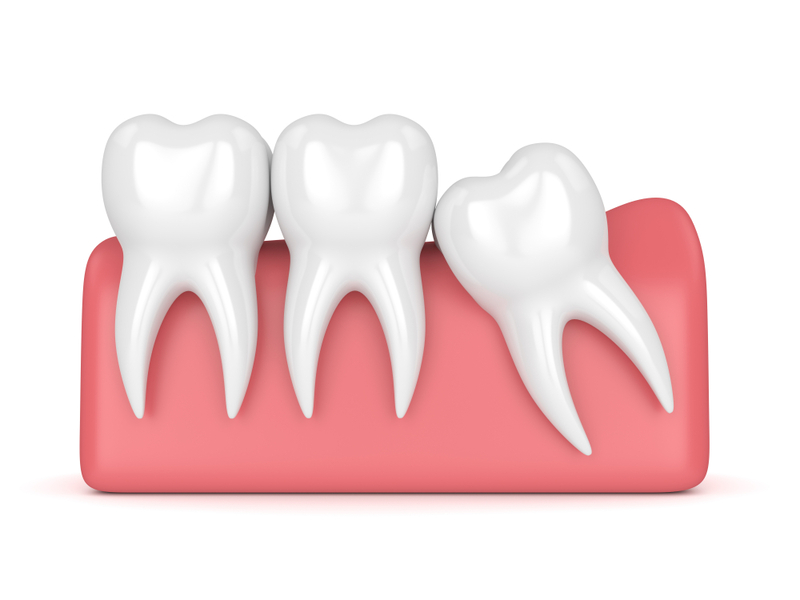 Wisdom teeth are the third molars in the back of your mouth and the last four of your 32 teeth to develop. Wisdom teeth become impacted when they press up against other teeth or otherwise do not have sufficient room to develop normally. Impacted wisdom teeth do not always cause pain, but proper treatment is still important. Failure to resolve wisdom teeth issues can lead to possible tooth decay and other dental problems that may cause a need for additional work. Full-Bony Impacted— A wisdom tooth completely stuck in the jaw. Partial-Bony Impacted— A wisdom tooth partially stuck in the jaw. Soft-Tissue Impacted— A wisdom tooth stuck under the gum. Erupted— A wisdom tooth that has already appeared in the mouth. Red or swollen gums— You may notice some increased sensitivity in the gums in the rear of your mouth. Some of these cases may involve gum disease. Tender or bleeding gums— Similar to swollen gums, a person’s gums may bleed when they brush or floss. Jaw pain— When a tooth has partially erupted, a portion still remains in the jawbone. Teeth may be trapped below the gumline or growing in sideways. Swelling around the jaw— Swelling in the jaw can often cause many people to experience certain taste issues. Bad breath— Because a partially trapped wisdom tooth can trap food you eat, it can make the food harder to remove. This often creates unpleasant odors within the person’s mouth. An unpleasant taste in your mouth— As mentioned with jaw swelling, many impacted wisdom teeth issues cause people to notice that the food they are eating often tastes somewhat funny. Difficulty opening your mouth— Some difficulty opening the mouth may be expected after certain dental procedures, but other issues stemming from impacted wisdom teeth can cause other difficulties that are somewhat unexpected. When a person cannot fully open their mouth, it affects their ability to speak, eat, or perform any number of other basic activities. If you experience any of these types of symptoms, do not wait to seek appropriate dental care. Failure to correct impacted wisdom teeth can lead to possible tooth decay, gum disease, cysts, or other damage to surrounding teeth, jawbone, and nerves. Babylon Dental Care provides top of the line dental care including help for impacted wisdom teeth, and our team is ready to help you with any dental issues you may be facing. Call (631) 983-6665 or contact us online to see how we can help.